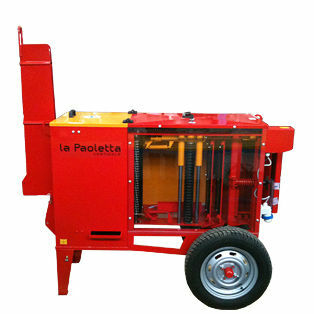 The first combined cleaning machine for planks and panels provided with automatic spray oiling system with an electric pump and rotating brushes. 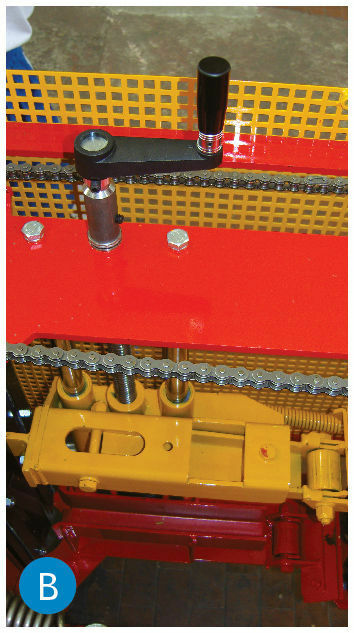 The adjustment of the dimensions of the board to be cleaned is made thanks to an handle positioned above the machine. The operator can perfectly monitor the work of the panels cleaners from outside because of the unbreakable transparent Lexan panel. 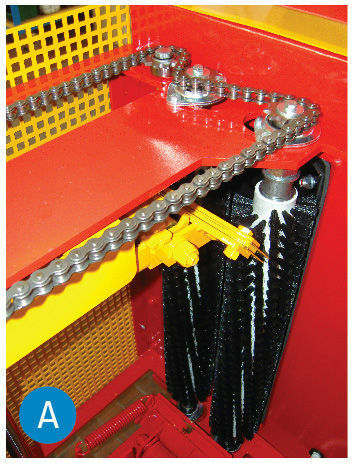 TO LET PANELS LAST LONGER you should use acleaning machine Paoloni: it means to delay of 10 times their purchase. It takes less than 1 hour to clean and oil on the four sides 150 panel (4 meters long)! [A] The rotating motorized brushes take off from the panels the crumbling cement before the oil spray. 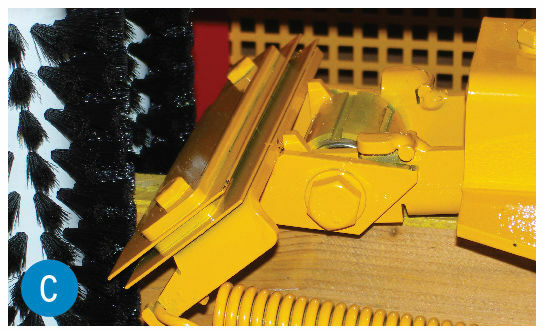 [B] The handle positioned on the upper part of the machine adjust the width of planks and panels from 8 cm up to 50 cm (the measurement bar has a size indicator). [C] The four crumbling rollers break the hardened cement in every sides, before the blades made of carbon scratch the plank surfaces. 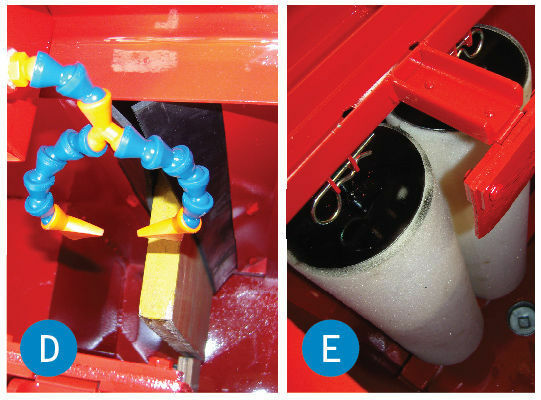 [D] The electric pump sprays oil through the nozzlesand the polyurethane rollers [E] spread the oil without wastes. [F] The folding rudder supports the panel coming out from the cleaning machine and helps the operator to move on yard site the panel cleaners. [G] The trasparent lexan carter allows to verify the movement od the planks inside.